To many it may seem odd that i am posting a recipe for ice cream in winter. But where i come from, the weather is hot through the year, so ice creams are welcome 365 days a year. 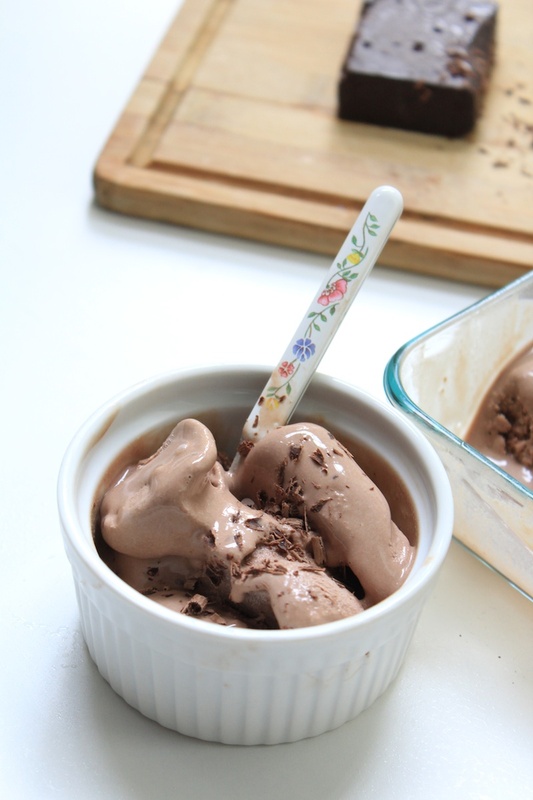 This particular recipe for chocolate ice cream is a low fat, eggless version. While the taste is as good as the store bought ones, this ice cream is not as creamy and soft since ive avoided egg yolks & high fat cream (double cream)and also because i have used a little bit of milk. So before serving you may do well to let it thaw for 5-10 minutes. This version of ice cream is pretty simple. Try it out and let me know your comments!!! Mix gelatin in 2 tbspns of warm water till it dissolves. Keep it aside and let it cool. Place 2 tbspns of cream and the dark chocolate on a double boiler. Keep it on the double boiler till the chocolate melts and blends well with the cream. Take it off the double boiler and let it cool. Beat the remaining cream and milk till it forms light peaks. Now add the chocolate cream mixture and gelatin mix well. Pour into a container and freeze for a couple of hours. Take it out and beat it well. I love that this does not require an ice-cream maker! What a win! thus it's nice to read this website, and I used to pay a visit this webpage every day.